Despite being a relatively rare type of habitat, cloud forests support a notable share of global biodiversity. It’s no surprise then, that Monteverde’s famed, lush forests support a fascinating array of creatures. 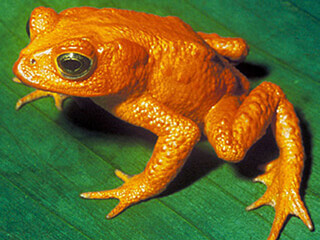 In the late 1980s there was an alarming change, when naturalists observed a markeddrop in local amphibian populations. 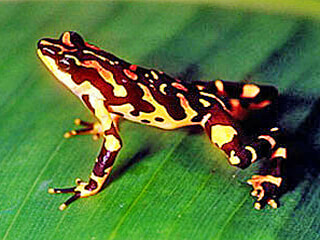 Twenty out of 50 species of frogs and toads disappeared, including the unique golden toad (Bufo periglenes) and the Monteverde harlequin toad (Atelopus sp. 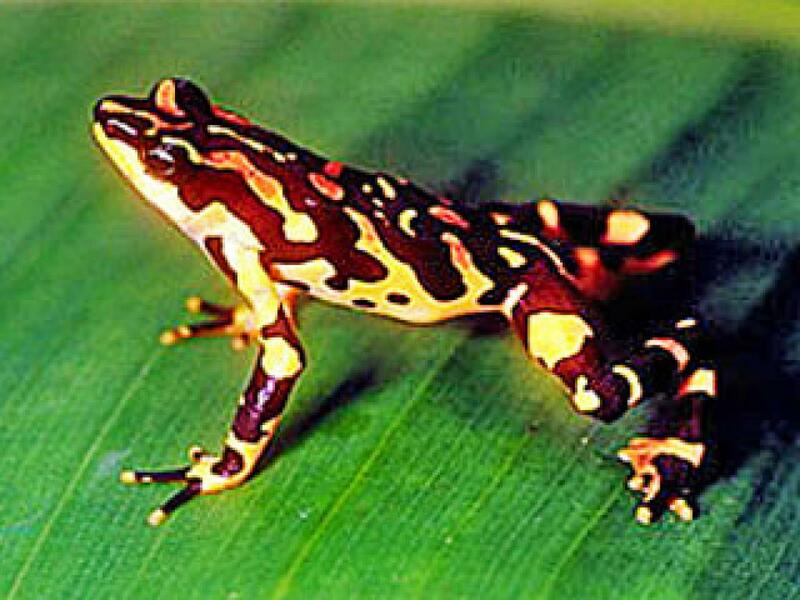 ), although the harlequin has since been found in 2003 in another part of Costa Rica. Populations of many reptiles and birds were also changing. The numbers of anole lizards, which are sensitive to changes in rainfall, also began to decline and some disappeared. Some birds that used to breed only in the lowlands moved to higher elevations, for example the Keel-billed toucan (Ramphastos sulfuratus) and several species of hummingbirds. Others that live at higher elevations started to decline in abundance. The fact that all of these changes in different animal populations were happening simultaneously, in correlation with local climate patterns, suggested that a large-scale response was occurring directly related to changes in regional climate. Indeed, the climate of Monteverdehas been changing rapidly, tending towards warmer temperatures, less precipitation, and longer mist-free periods during the dry season. This shift is critical because the entire ecology of cloud forests depends on heavy moisture in the air. Any factors that alter cloud formation can also influence soil moisture and structure, nutrient cycling, and the vegetation in cloud forests. It follows that animals must also be the affectedby such environmental changes. The original cause of the population crashes was thought to be climate change on a large scale. Rising land and sea temperatures are affecting plants and animals around the globe. In this case, the hypothesis was that rising sea surface temperatures was warming the climate of tropical mountains. Subsequent studies of climate patterns showed that deforestation was actually an important underlying cause.The wet environment and associated rich vegetation of the cloud forest depends on trade winds that bring moisture into the mountains. Climate simulations revealed that forest clearing at lower elevations has a stunning effect on those moisture levels. It results in warmer air temperatures, and causes water vapour to condense at a lower temperature. That means it has to be colder for fog to appear. Also, forest clearing often compacts the soil, causing reduced infiltration of rainfall, increased runoff, and ultimately lower soil moisture. 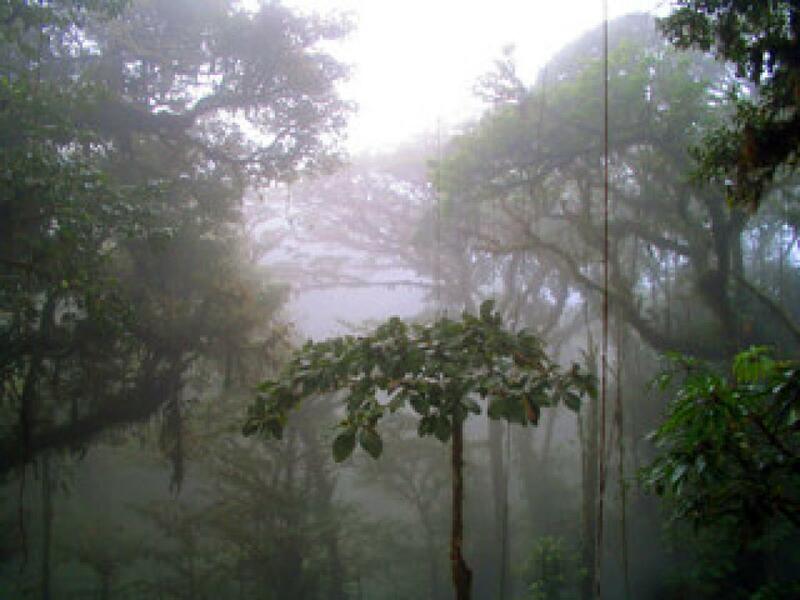 Further analysis suggests that deforestation in the lowlands and premontane forests has decreased the area of fog-covered cloud forest in the mountains, by an estimated 5-13%, and raised the height of cloud bases by 25-75 metres in the afternoon. A lifting cloud base can affect regional hydrology by lowering the amount of moisturein the air during the dry season, when it is needed most. Further, models predict that continued deforestation will lead to even greater climate impacts on the cloud forests. However, it seems that these two key factors are working simultaneously — that is, deforestation and climate change are both affecting Monteverde’s forest wildlife. More recent studies have found that the disappearance of amphibians is linked to the outbreak of pathogens, which have been thriving at high altitudes because of the warming climate. This is yet another example of the direct link between climate change and patterns of biodiversity. Undeniably, human activity is altering the flora and fauna of Monteverde and other tropical rainforests. To summarize, environmental change from multiple sources is altering patterns of precipitation, and this in turn affects biodiversity in cloud forests by changing populations, causing species to disappear, and radically altering communities of birds, reptiles, amphibians, and possiblysmaller, less charismaticorganismswhose changes go unnoticed. The ripple effects of such community changes carry on, because so many complex species interactions drive the functions and processes of tropicalecosystems. In fact, the effects of climate change may be felt even more in cloud forests, because they are so full of epiphytes. These plants provide food and shelter for numerous microorganisms, are important for forest productivity, and are known to be extra sensitive to environmental change. The impacts of climate change and deforestation on Monteverde’s forests are a classic example of thecascading, far-reaching environmental impacts of human activity. What remains to be seen is if, and how fast, the situation might be turned around, if we ever wake up and stop the damage our species is causing. Deliso E(2008). Climate Change and the hummingbirds of the Monteverde Cloud Forest, Costa Rica. Centro Científico Tropical, San José, C.R., 42 p.
Lawton RO, Nair US, Pielke Sr RA & Welch RM (2001). 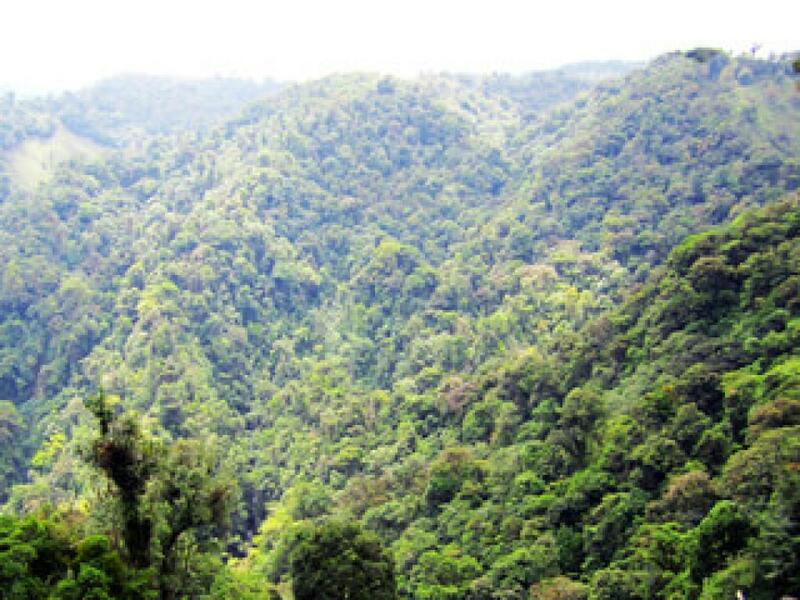 Climatic impact of tropical lowland deforestation on nearby montane cloud forests. Science 294:584-587. Nadkarni NM & Solano R (2002). Potential effects of climate change on canopy communities in a tropical cloud forest: an experimental approach. Oecologia 131: 580-586. Pounds JA, Fogden MPL &Campbell JH (1999). Biological response to climate change on a tropical mountain. Nature 398: 611-615. Pounds JA, Bustamante MR, Coloma LA, Consuegra JA, Fogden MPL, Foster PN, La Marca E, Masters KL, Merino-Viteri A, Puschendorf R, Ron SR, Sánchez-Azofeifa GA, Still CJ &Young BE (2006). Widespread amphibian extinctions from epidemic disease driven by global warming.Nature 439:161-167. Ray DK, Nair US, Lawton RO, Welch RM& Pielke Sr RA(2006). Impact of land use on Costa Rican tropical montane cloud forests: sensitivity of orographic cloud formation to deforestation in the plains. Journal of Geophysical Research 111(D2):D02108.